What’s wrong with today’s “protest art”—which occupies so much of our public space? Mainly this: it’s long on protest and virtually devoid of art. Dread Scott, A Man Was Lynched by Police Yesterday, 2015. Nylon flag. Whitney Museum of American Art. That sad fact has been vividly demonstrated of late by two New York exhibitions: Art and China after 1989: Theater of the World (closed January 7 at the Guggenheim) and An Incomplete History of Protest: Selections from the Whitney’s Collection, 1940–2017, now on view at the Whitney Museum. I should add that Dread Scott first attained notoriety with his 1989 protest piece What Is the Proper Way to Display a U.S. Flag?, which he called an “installation for audience participation.” The participation it invited was for viewers to step on the American flag while writing their thoughts in the comments book displayed above it. That this participatory installation was part of an exhibition organized by Scott’s fellow students at the School of the Art Institute of Chicago tells you something about the caliber of art instruction at that institution. Yet degrees from such institutions are what qualify someone as an “artist” these days. Paul Cadmus, To the Lynching, 1935. Graphite pencil and watercolor. Whitney Museum of American Art. By the same token, Scott’s “A Man Was Lynched” flag is so-called art. Although it manages to trigger a momentary emotional response by Scott’s having substituted the negatively charged verb “lynched” for the blander but more precisely relevant term “shot,” it pales in comparison with the impact of a genuine work of art dealing with the same theme. For example, Paul Cadmus’s drawing To the Lynching (1935)—unlike Scott’s flag—chillingly embodies the brutality of a lynch mob. 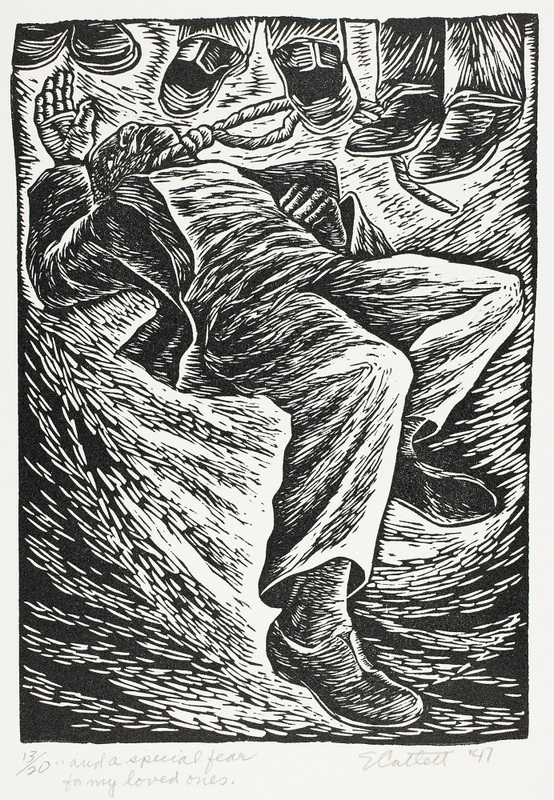 So, too, Elizabeth Catlett’s linoleum cut And a Special Fear for My Loved Ones (1946) starkly conveys the power of the lynchers and the helplessness of their victim. Moreover, by representing the human dimension of such acts, these images transcend the particular circumstances of any single injustice to convey something more universal. That is what makes them art, in contrast with Scott’s mere verbal protest against one unjust event. Since both of these works are actually in the Whitney’s collection, why were they not included this exhibition? (The 1940 starting date could have easily been extended back five years to accommodate the Cadmus drawing.) Might it be that such works of genuine art would have revealed the relative feebleness of more recent protest pieces? The vast majority of the works displayed at the Whitney, like so much “contemporary art,” rely heavily, if not exclusively (as in Scott’s lynching flag), on verbiage to get their message across. Those that employ imagery do so mainly through photographs—not through the arts of drawing or painting. In a gallery devoted to Vietnam war protests, two whole walls comprise anti-war posters that make use of both words and photographs, as well as of some simple imagery. According to the docent I happened to hear, they were “not meant as art,” however, but were intended as “ephemeral” items to be posted on one’s dorm room wall, for instance, and then discarded. When I asked why they are being exhibited in a museum of art, she responded that we can now appreciate their “artistic qualities.” Just what those qualities are she did not say. Perhaps the most absurd of the Whitney’s exhibits is Spaces and Predicaments [scroll down and click on thumbnail], comprising two abstract installations: Pyramid Up and Down Pyramid (1969), by Melvin Edwards, and Internal I (1977), by Senga Nengudi. The wall text informs us that these artists “chose personal, oblique, and allusive means to question how social spaces are made, engaged, and controlled.” Oblique and elusive might have been a more accurate description. Activist-artist David Hammons is quoted as saying that their work is “abstract art with a message.” I defy anyone to discern the message from the work alone, however. Like most contemporary work, it is unintelligible without a verbal gloss. four pairs of American pit bulls tethered to eight wooden treadmills. The camera closes in on the animals as they face each other, running at high speed. The dogs are prevented from touching one another, a frustrating experience for animals trained to fight. The dogs get wearier and wearier, their muscles more and more prominent, and their mouths increasingly salivate. Although animal cruelty was the main public concern, some of the many comments posted by readers in response to the Times article astutely questioned whether such work should even qualify as art. As I noted on Facebook on October 12, the Guggenheim withdrew the three most offensive pieces. But far from acknowledging that such pieces were in fact morally reprehensible, the museum’s press release merely cited “concerns for the safety of visitors, staff, and participating artists after ongoing and persistent threats of violence in reaction to the incorporation of live animals in the creation of the works.” Moreover, it missed the larger point made by many Times readers, including me. 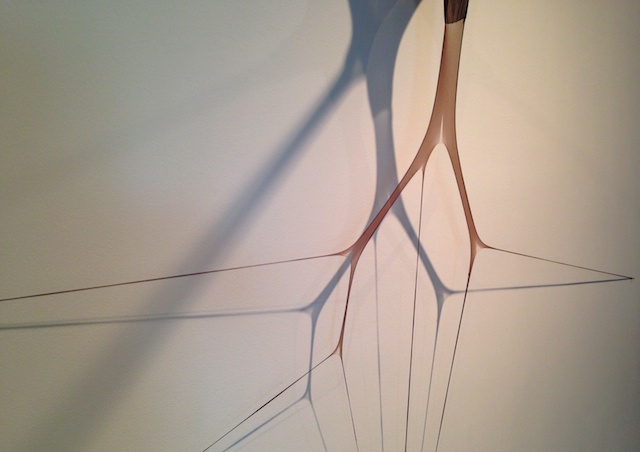 Such “conceptual” pieces should not be regarded as art. Yet the Guggenheim show consisted almost exclusively of such work. As I’ve indicated in “Is Ai Weiwei an Artist?” and argued more fully in Who Says That’s Art?, however, “conceptual art” is an entirely bogus genre. It began as a deliberate anti-art phenomenon, just one of the many bizarre postmodernist reactions against the dominance of Abstract Expressionism. In fact, its first theorist, Henry Flynt, is explicitly characterized as an “anti-art activist” (emphasis mine) on his authorized website. Apart from the troubling fact that “conceptual” work invariably “defie[s] easy explanation” (as the Guggenheim itself acknowledged in its introductory wall text), the term falsely implies that what is distinctive about such work is that, allegedly unlike traditional art, it deals with ideas. Genuine art has always dealt with ideas, however. The difference is that in traditional work the ideas are embodied in intelligible imagery. They are conveyed directly. Wang Xingwei, New Beijing (2001), oil on canvas. Guggenheim Museum, New York. Consider, for example, two of the few paintings that were included in the Guggenheim show. 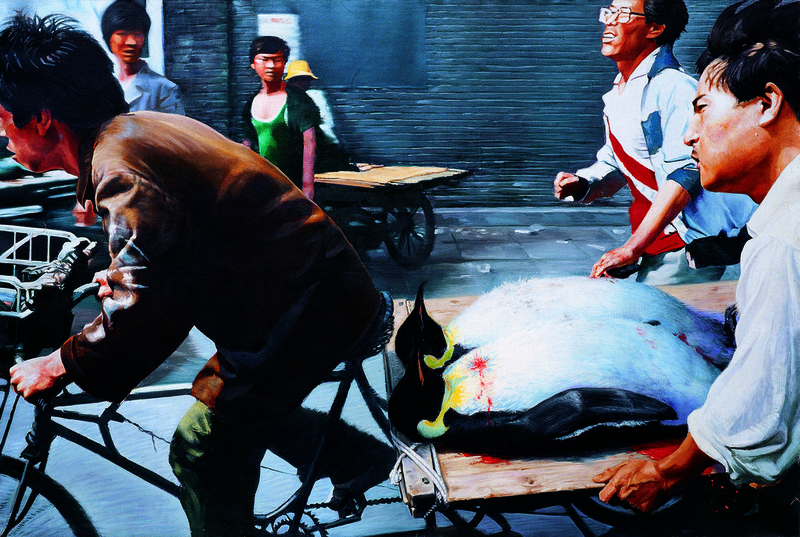 Wang Xingwei’s New Beijing (above) depicts a street scene in which two bloodied penguins lying supine on a wooden stretcher are being hurriedly transported by bicycle past two staring onlookers. The image has the impromptu quality of a news photo captured on the run. Created soon after Beijing had won its bid for the 2008 Summer Olympics, New Beijing is an ironic allusion to the tragic Tienanmen Square Massacre of 1989, in which peaceful protestors were brutally shot down by government forces. 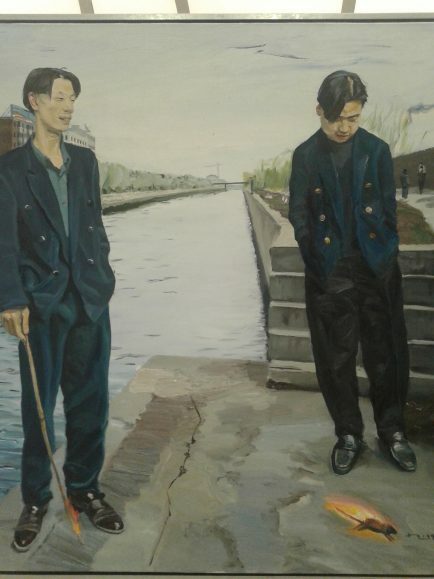 Also chilling is Liu Xiaodong’s Burning a Rat, showing two well-dressed young men standing on a river embankment, enjoying the spectacle of watching a rat die that they have set fire to. It is a disturbing embodiment of utter anomie. 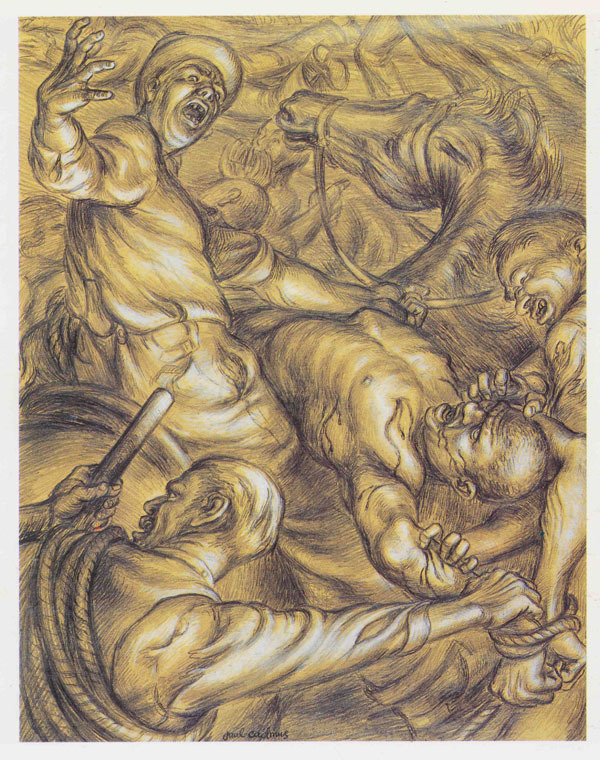 Such works were notable exceptions to the countless protest pieces that have no relation to art, however. More effective as political protest but even farther removed from the realm of art was Ai’s most acclaimed instance of anti-government activism, his Sichuan Earthquake Names Project—prominently featured at the Guggenheim. Heartrending videos of survivors testifying to the loss of loved ones in the face of bureaucratic evasions and irresponsibility were displayed alongside a list of the thousands of victims identified by the project. Moving though this testimony to tragic loss and monumental wrongdoing was, it constitutes a species of documentary reportage, not a work of art. Curators and museumgoers alike should recognize the difference. So much to take in and to be said. As I just watched the film Three Billboards, I’m reminded of when I took my Private school students to see the Mapplethorpe exhibition in the Hartford CT, Wadsworth Anthenaeum in the 1980s. The exhibition was banned from the Corcoran and many US Museums, yet we had it here! Students were prepped, parents were informed, and the work was displayed allowing the viewer to choose whether to see it or not as many pieces were laid flat. The point being… Art creates a reaction. That it did.It stirs emotions and often creates the change necessary. That is what we hope for here. After 38 years of teaching I am now working with only Autistic students who have NO filters. This is exactly what we are talking about… So, we must allow artists to continue and allow spaces for such.. My thoughts.. I disagree with harming environment, humans, and animals of course in doing so..
Can’t harm can be psychological as well as physical, Donna? And many things besides Art provoke a reaction. A crucial question is what sort of reaction is elicited? Mapplethorpe was a photographer, not an artist (though blurred in today’s artworld, there are important differences between the two categories, as discussed in my book). The natural reaction to much of his work for some people is one of shock and discomfort. For others there might well be a prurient interest. In any case, despite Mapplethorpe’s artworld acclaim, I would not have taken high school students to his controversial Perfect Moment exhibition, given the often troubling treatment of human sexuality, among other things, in some of the work. What is the value of such school-sanctioned exposure for young people? As argued in my book, we should of course allow would-be artists the liberty to create whatever they wish (as long as they do no harm). But we owe it to ourselves and our children to exercise prudent judgment regarding which work/artists we choose to celebrate and teach about. The conflation of art with its purposes is always a difficult issue to examine. I tend to agree that the purposes of art, if they can be disentangled from essential aesthetic concerns to lay bare “art proper” might be ranked, some better, some worse, for art. For example if “protest art” has a rather weak relation to art proper, is it also true that “patriotic art”, “commemorative art”, or “religious art” have similarly weak claims to being essential to art proper? To my own astonishment, I agree, this time, with Michelle’s remarks about much protest art being too dependent upon words and slogans that have no need to be in an art context for their meaning. Her reference to Cadmus is a good one to make her point. However, she is too quick to blame artists for the art she dislikes. The curatorial process is what really determines what is seen in museums and it can be influenced by all types of social and market realities (and ambitions). Almost all possibilities for art are always being practiced. It’s true that not all are universally relevant. The gatekeepers in museums, galleries, art press, politics, and among collectors have far more to say about what is seen as “art” than any artist. They decide what’s relevant. In today’s increasingly polarized social and political contexts, it’s difficult, but important, to seek something more fundamental to art than superficial fickle propaganda and illustration of political, class, race, gender, and commercial values. More and more, the gatekeepers are pretending that these superficial traits, the patched on purposes, are intrinsic to art. In answer to William’s question regarding the “weak relation [of today’s ‘protest art’] to art proper,” I do not think it is “also true that ‘patriotic art,’ ‘commemorative art,’ or ‘religious art’ have similarly weak claims to being . . . art proper.” The problem as I see it is not the content but the form in which the content is presented. I call myself an artist. I mostly do modern impressionistic landscape pieces. I thought your criticism of the art world is superb. Thank you for sharing!